How Far is Sivah Chapter One? Sivah Chapter One is one of the residential development of Sivah Buildcon. 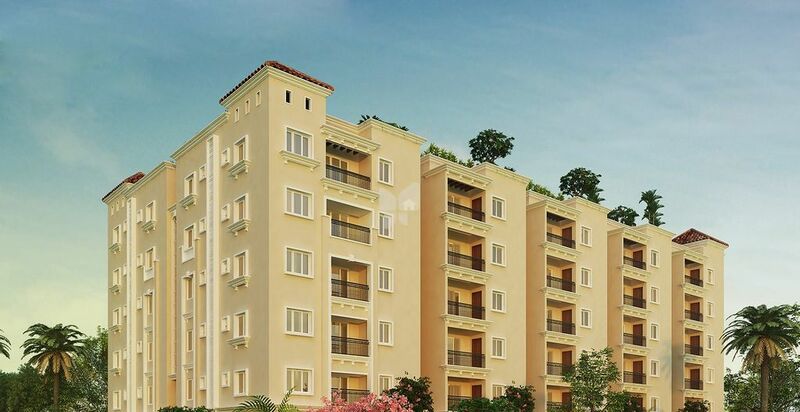 It offers skillfully designed 2BHK and 3BHK apartments. Project has been designed to facilitate perfect living conditions with optimum light, ventilation and privacy, coupled with fresh and green surroundings. Each apartment brings the joy of unhindered living. Designed as per Standard Practices duly considering the soil strata and making provisions for Seismic activities. 150 MM CC Block Masonry for External & 100MM Block Masonry for Internal walls and Plastering with double coat sponge finish. • Vitrified Tiles (2' X 2') in living, Dining, Master bedroom, Children's bedroom, Guest bedroom and Kitchen. • Ceramic wall tiles (2' X 1') up to 2' height for kitchen from counter level. • Main Door - African Teak wood with frames and Shutter with Mortoise lock and brass hardware. • Internal / Toilet doors - MT wood frames with flush doors with good quality SS Hardware. • Ventilators - MT wood frames and glass louvers with security gril. • Staircase - MS Railing as per design. • Acrylic Emulsion for Living, Bedrooms, Kitchen and Dining. • Oil Bound Distemper for staircases, Lobbies and all external & internal ceilings. • Combination of Texture & Exterior emulsion paint for Exterior walls and Balconies. • Enamel paint for Railings & Grills. • EWC - From Jaquar /Roca / Hindware /Equivalent. • Washbasin - from jaquar/Roca/Hindware/Equivalent. • CP Fittings - from jaquar/Roca/Hindware/Equivalent. • Concealed Diverters for showers in all Toilets - from jaquar/Roca/Equivalent. • Hot & Cold Water provision for all washbasins in Toilets. • Kitchen Sink - Mixer with Raw and Municipal Water Provision. • Utility - Provision of Washing Machine and one tap. • Power for each flat - 3 BHK-5KW/2BHK-4KW. • Generator Backup for each flat - 3BHK-2BHK-2KW/100% for Common areas. • Fire resistance Electrical wires. • TV & Telephone points for living & all Bedrooms. • Switch Plates/Switches- Modular Switches- Anchor / Crabtree / equivalent. • Exhaust fan provision in all toilets. • Water purifier provision in Kitchen. • Instant Geyser provision for Utility. • Washing machine provision in Utility. • Chimney / Hob point provision in Kitchen. • Dish wash provision in Utility. • One 5 A point in all Balconies. • One light point in front of all Main door of the flats.